Pegasus™ 2AA NV Green Training Model (NSN: NSN: 5855-01-618-0394) is a visible Night Vision Green signaling beacon used during training operations in place of the Pegasus™ 2AA Infrared Beacon (NSN: 5855-01-618-0405). Pegasus™ 2AA NV Green Training Model (NSN: NSN: 5855-01-618-0394) is a visible Night Vision Green signaling beacon used during training operations in place of the Pegasus™ 2AA Infrared Beacon (NSN: 5855-01-618-0405). 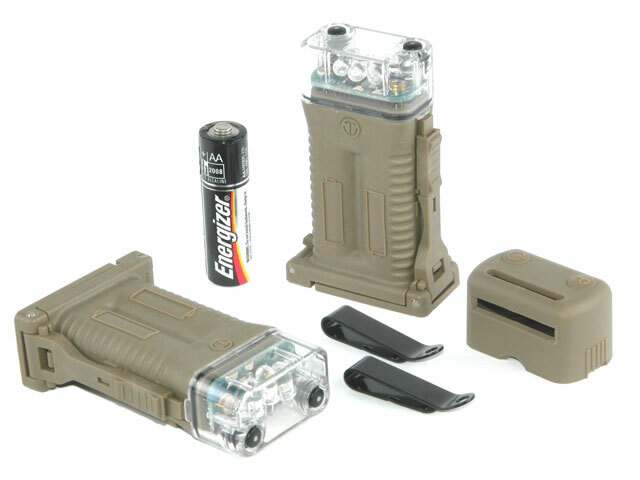 The NV Green Training Model can be seen with or without night vision. Pegasus 2AA superbly suited for water to land deployment and special operations applications. The Pegasus 2AA has three user-selectable flash patterns; the first code pattern is a fixed flash rate code identical to the Phoenix Jr., the second code pattern is the International Morse Code signal (S–O–S) and the third is installed as needed by the user in the field. The beacons signal is turned ON or OFF simply by "double clicking" the power button. This double click action prevents the beacon from being inadvertently activated or deactivated. Programming and flash pattern selection is carried out via the programming button located on the top of the unit. Miniature indicator lights within the device will flash the pattern as it is being recorded by the user to confirm the code being stored. Code Memories: Three; Phoenix Jr. fixed flash rate, International Morse Code signal and user defined. Options: Pegasus 2AA IR (902218IR), Pegasus 2AA Red Training Model (902218R), Pegasus 2AA NV Green Training Model (902218NV).